Materials: 4 regular sponges, scissors, dental floss…and a bucket of water! 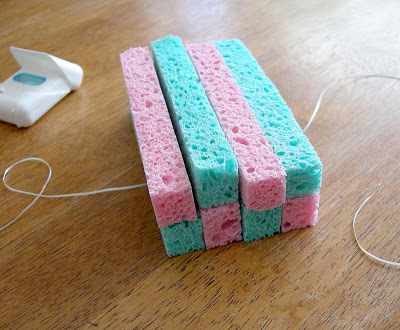 Step 1: Cut sponge lengthwise into four equal strips. 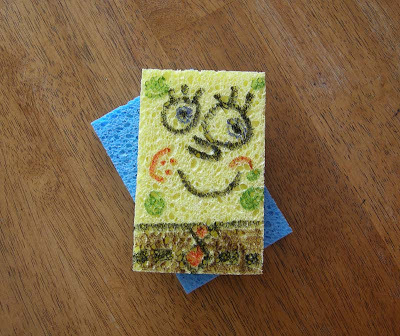 Repeat for second sponge. 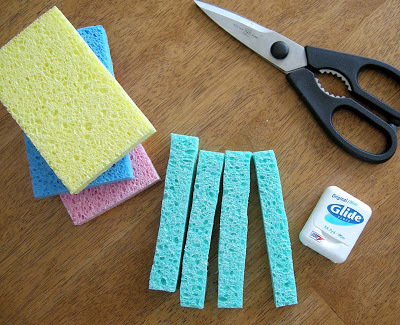 Step 2: Stack sponge strips as shown, alternating colors. Place length of dental floss under stack. Step 3: Tie floss around stack, drawing strips together into a pom-pom shape. Wrap tightly and knot. Step 4: Fill a bucket with water and have fun! As you can see, here we have Sponge Bob instead of a second Sponge Ball, thanks to my older son! This is such a great idea! I just wish I had kids so I could throw these at them! That seriously rocks! Thanks for sharing this. sea(at)cox-internet(dot)com and put Crafty Crow Submission in the subject line. My kids will love these. Off to the dollar store for some sponges! Love the family portrait. I was born in 1968, and I think the world was a lot easier when we were young. I’m sad that is has all changed so much. 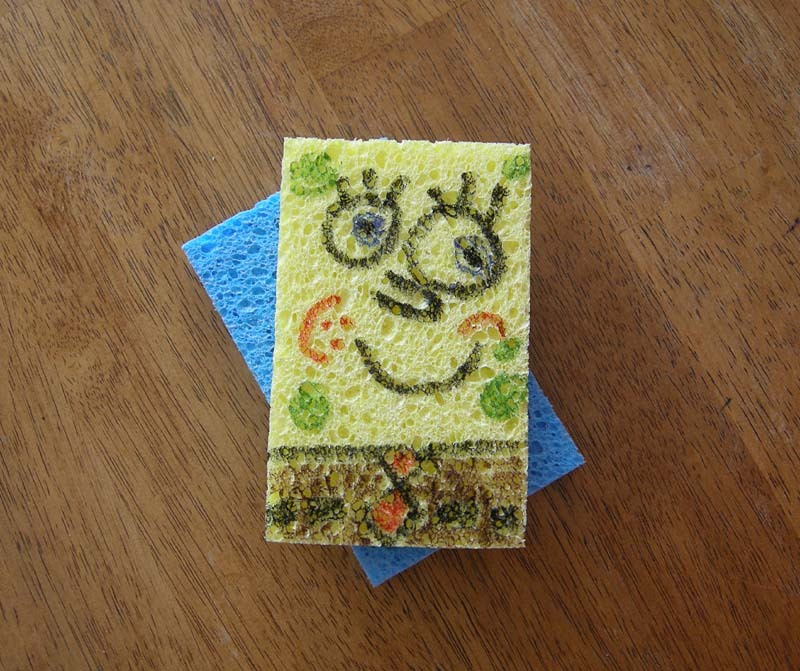 Oh my gosh, that is cute……the tutorial is too, but I really like Spongebob! I have a 3 year old daughter who is infatuated with the little yellow guy. I can’t wait to show her your sons artwork, but I better get some sponges in the house first as I know what we will be doing next! Thanks Betz! Great idea! A lot more safe for the “little” ones! Great idea! Lots of fun to be had with those!! Awesome Betz! Thanks. I have two boys here that will love this! I have seen this before but thanks for the reminder! Clever! Definitely will try this soon. I foresee mudbombs coming out of this, but oh well! ooo those are perfect!! I am so hesitant to have balloons in my house. My 5yr old daughter has Down Syndrome and still puts EVERYTHING in her mouth. These might just be a safer alternative! Neat idea. Thanks for sharing. This would make great summer party fun. Your son is quite the artist! Oooooh, I love this one. Must try immediately. 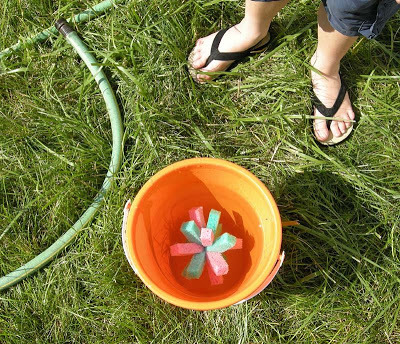 You didn’t mention how you have to pick up all of the balloon pieces left all over the lawn with water balloons. That is my least favorite part. 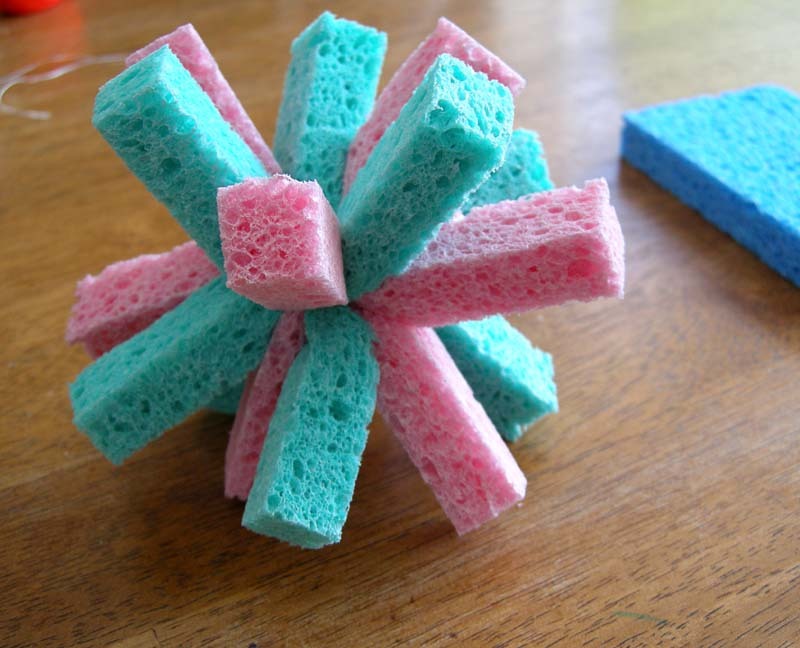 The sponges are the perfect alternative. i saw these sponge balls in the Kid Concoctions books. i just didnt want you to get in trouble for submitting it. whoever thunk it up first, its still a great idea. (feel free not to post this comment, i wont be offended.) bought the book, love it! Are adults allowed to make and play with these even after children are grown up and moved away? Thanks, that’s why I mentioned at the top of the post that this was not my original idea…I thought I saw it in a magazine…now I’m thinking Family Fun? Anyway, I’m happy to give the credit where it’s due, to whomever that may be! Great idea, and so easy! A year or so ago one of our grandkids had a birthday and towards the end of it there was a huge water balloon fight. Everybody got involved, adults included, and it was such fun. This post has me hoping for another, tidier set-to! This is such a good idea! I am always looking for things to do with my daughter who loves to craft! At the end of the school year this year, we were looking for some type of water play. These would be cool to make one morning and then take out to play with in the afternoon. Lol! I love how one of them became sponge bob. I laughed so hard when I saw that. My kids and I made these last summer and they were a huge hit! We used zip/cable ties instead of the dental floss. My hands are a bit arthritic, so it worked better, plus they fan out so much you don’t even see/notice the trimmed plastic. My kids will seriously love this! They are always trying to ambush daddy who “cheats” at water fights–he just pulls out the hose and soaks ’em with it. I can’t wait to try these….Perhaps I will set up an ambush! Your tutorial is much better than Martha’s. Very cute! I think we might try that! I know Walgreens has a big bag of those plain sponges for pretty cheap. Spongebob is too cute! yes,yes,yes. We love water balloons at our house, but hate the thought of birds or other critters eating the burst balloons. Made these the same day you posted them. FUN TIMES!!! Thanks!! These really are good CLEAN fun! I wish you could hear my kids happily splatting each other with our new sponge balls. It was a 90 degree day in the woods in Oregon–it must be so hot in Maryland. This is the perfect ending to our day. Thanks, Sarah. these are so fun, we are enjoying them in puerto vallarta! We make those except we use small plastic wire ties as they stay on better than the dental floss. My kids always break the dental floss somehow. Just trim the ends of the wire ties close. with the addition of a big rubber band added right before closing them up, turns them into sponge flingers. We made these a few years ago, and it was Martha where I got the idea. For some reason I don’t say on my own blog whether it was magazine or internet idea though. What a great idea. I will make many of these for our family reunion at the lake this week! I love it. Thanks! Fantastic idea because you get the water balloon messy freak out the dry target person reactions and no broken balloon mess to clean up- YEAH!!! How wonderfully fun…my 4 littlest ones will love these in their water bins outside (we opted to set up the pool this year and use the nearby lake instead.) Oh, I am going to buy some sponges and I can hear the glee and squeals of delight already…listen, do you hear them? I just made these today. I can’t wait to send my boys out with a bucket of water. I did find that I had a difficult time with the floss. It kept breaking. I used rubber bands. Then came in here to read comments and let you know I gave it a go. I really think that the zip ties would have been a better option for me as well. Those are great! I can’t wait to try them with my niece and nephew. I love these!!! We are totally doing these this week. Thanks!! The water balls are a blast, can you use wire to tie them togather? Not sure about wires, might end up scratching somebody. Try zip ties or rubber bands. We are using this idea for our school carnival. The people who hate to fill water balloons LOVE this idea. THANKS! Another nice idea! I never thought that you can use your floss for something like this. I can now say that dental floss can be really useful, not just to keep your teeth clean. it’s the perfect little toy for a hot summerday in garden. I’m 12 years old and i’m gonna try this with my little sister… But, she always starts crying when she gets wet, or loses. Any ideas to calm her down? Anyways, thanks for the idea. Great work!